1. Battery strength Playbook how? Depending on usage. But with moderate usage. Can overalls all day, charger at night before bed. 2. Microsoft Office application viewer / editor and a PDF reader / editor smoothly or not in the Playbook? 3. Wifi create what its main function if it's at the bridge all the way to the Blackberry ... what's just for browsing only? Bridge function for PIM apps just like the bridge browsing, push email, calendar, memo, task. However, to access the app world (only Wifi), or any application that needs the internet (games etc.) must Wifi or tethering. 4. Applications can be downloaded at the Blackberry is not compatible together in Playbook, if iPad iPhone apps can be installed into the iPad, although the small screen and must maximize 2x. Now 'not' can, but the future of this PB QNX os promised by RIM will be compatible to run android apps (with android player) and have a mobile java app like Blackberry. 5. bridging the now steady? Latest Update Bridge has been pretty stable and faster. But sometimes there are minor issues. Such crashes. Whatever, the critical minimum for running OS5 bridge. But keep in mind that the current bridge, memory drain and drain battery must be a bit depleted; it is very wise if the bridge to the Blackberry that had a great memory, as well as strong battery. (Egg onyx2, torch). 7. The main drawback Playbook what? • Its application in appworld, still need time to wait for other apps-apps popping up. • son the truth is its excess, is also considered to be shortcomings because it has not stabilized, sometimes the browser may crash, or Playbook so slow so it must be restarted, etc, but only a minor issue that will be fixed with updates of his fore os. What needs to think first? If for multimedia, iPad its champion. Completeness of application, IPAD also champion. For business, I tend to select Playbook. • Bridge was able to browse his heart's Playbook at no additional cost. With features that are almost like browsing on a PC. • Quality of its layer when playing HD movies -> astonishing. • Gesture control -> Feeling rich in the future. • QNX OS it ... Great potential. • True multitasking.... need not be described. • Its size, the mobile. • The size is more portable with 7 "display Playbook very easy to carry anywhere, can enter the bag and not so strange when carried or worn in public places. 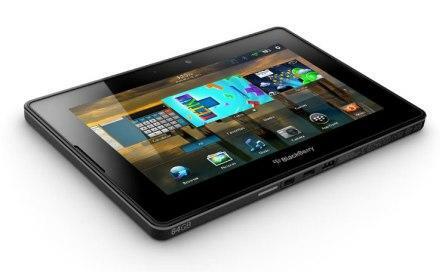 • Using the QNX OS Blackberry tablet-based, unlike the Blackberry OS which has been there at the Blackberry Smart phone. 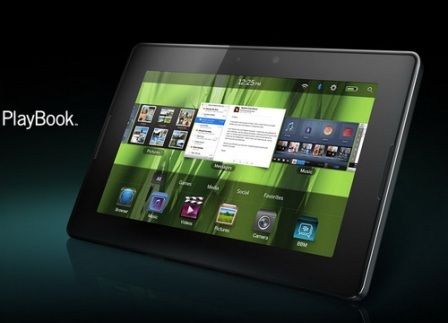 Playbook OS is also designed to support the Android applications. • User interface is quite nice and smooth, easy and quick navigation. It also has support multitasking. • Word processing application from DataViz Documents to go is included in the package. • it would add little short..... Besides. The apps are minimal (the same as its excess): OS QNX. • Due to the current OS is not yet stable, aka That is to say there are still many issues "that must be addressed and developed it ... For example: there is a report on his or her browser crashes sometimes, suddenly slow so it needs to restart once to refresh the memory (blackberry disease), the bridge is also sometimes crashes (but new versions of existing bridge progress), etc. 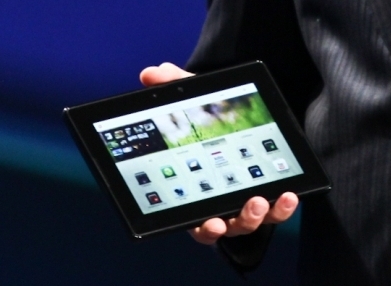 as well as some other minor issues .. IMHO it’s fair for the first QNX OS on a tablet. It used to IOS first appeared also with a variety of issues which in the end the fix with os upgrades next. in case an official guarantee, ask for warranty card show. manual book complete, charger, original sleeve (outer item color, blue color inside), data cable, cleaning cloth (the color of the item). check the volume button (+) and (-) and the power button On-off (pressed just make the check function is normal or not). 5. try play video in the playbook. If normal goods, it should be smooth-smooth. 6. Try to play music; check out the speaker quality is still good or not. 7. Try to connect Wifi on the playbook. Try browsing Wifi briefly to check the connection. 8. Bluetooth connects on your Blackberry with the playbook, if normal should be easily connected without any problems. 9. Trying to do bridge playbook with your Blackberry (do not forget to install the Blackberry bridge on your BB first), and try one by one bridgen menu. Last, try to ask for personal guarantees by the seller. 10. Battery while trying to do the charging, charging battery in the playbook is normal or not. 11. Try running one of the existing apps. 1. Make sure your OS Blackberry Playbook is the latest OS, how to check into the options (picture top right gear) and then to software updates, click the "Check for Updates". 2. Make sure your OS Blackberry Playbook is the latest official OS (it is advisable not hybrids). 3. In relation connecting this requires a fairly large memory suggested some such as the Blackberry 9700, 8520, 9300 OS5 who default to using OS 5 only. 4. Make sure the Bridge software is installed on your Blackberry is the latest, current version 1.0.4.9. Check in appworld from your Blackberry (free). 5. Make sure your fuel most recent version. 6. Make sure the fuel you do not have much huruf2/gambar2 fancy, this will prolong your connectivity to Blackberry Playbook.